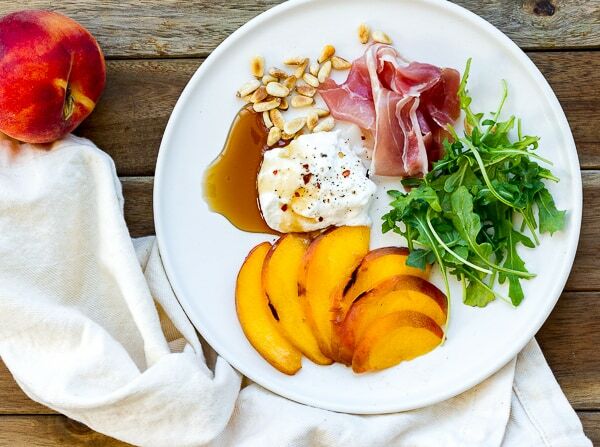 Looking for a simple and yummy way to use up the last of those juicy peaches? 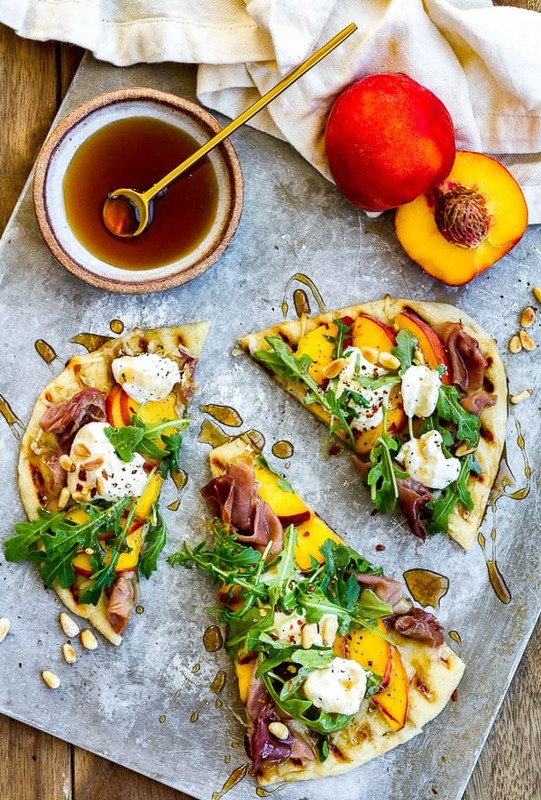 Try this quick and easy Peach Prosciutto Ricotta Arugula Pizza! I love using naan bread as a pizza crust. 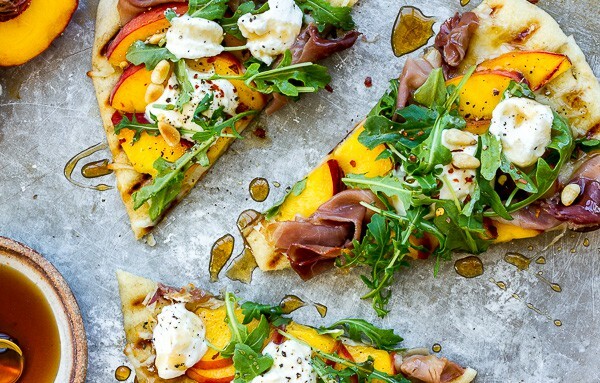 I used naan when I made Tomato, Mozzarella & Arugula Naan Pizza and Paneer Naan Pizza (both excellent pizzas so check them out) and that’s exactly what I used with this peach prosciutto ricotta arugula pizza. Quickly grill the naan to give it a little crispness, then add the toppings and bake for a few minuets in a hot oven and you one tasty pizza! You could even skip the warming up in the oven after you’ve grilled the naan and it would be more like a flatbread! So simple to make this anyway you like. For today’s pizza I used peaches and prosciutto, a wonderful combination, and topped it with fresh ricotta, baby arugula, toasted pine nuts and a drizzle of honey. 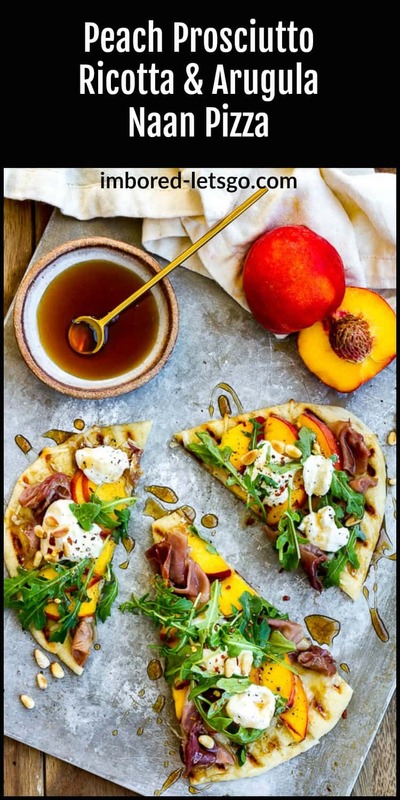 Give this Peach Prosciutto Ricotta Arugula Pizza and try… and be sure to let me know any other delicious combinations you come up with! There's no specific amounts per pizza, just use as much as you like! Brush each piece of naan with a little olive oil and grill each side to crisp it up and make nice grill marks. Top each piece of naan with some prosciutto, sliced peaches, a few dollops of ricotta. Heat each pizza in the oven for a few minutes to warm it up and melt the ricotta a little bit. Top with a handful of arugula, sprinkle some toasted pine nuts on top and drizzle some honey over the pizza. Top with a few grinds of fresh black pepper or red pepper flakes, if desired. Catch up with me on FACEBOOK, PINTEREST and INSTAGRAM, I’d love for you to follow along! Subscribe HERE and never miss a new recipe! Hi Judy, How are things in San Diego? So, I just made this dish and we loved it! I used mango, by accident, actually,. I was at an Indian store and did not remember you used peaches. Well, this mango is as good as the ones I tasted in Egypt years ago! So, I used the Trador Joe nan, which I highly recommend, as it is cooked on a tandoori grill and has this incredible flavor. Did everything else per the recipe, just no pine nuts. Wonderful! Hope you come visiting Seattle in the near future. I bet mango would be excellent with this and I love that you did your own spin on this recipe, even if it was by accident! Thanks for sharing!